Boost your child’s skills and interest in STEM (Science, Technology, Engineering, and Math) with the new Mini-Maker Kits! Each kit contains everything you and your budding scientist or engineer need to complete fun STEM-based projects. 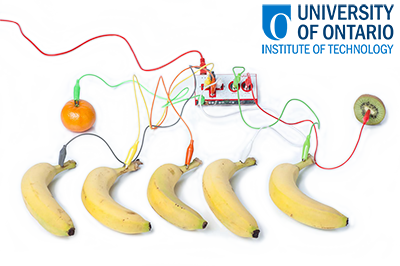 Construct a door alarm or traffic light, explore creative computing with apps and games, or create a tinfoil dance pad or fruit piano! One of each kit is available for holds, while the other two are available in-branch on a first-come, first-served basis. Each kit may be borrowed for one week. Offered in partnership with the University Institute of Technology Faculty of Engineering and Applied Science. $1.00 per day late fee. Kit may be picked up at or returned to any branch. Kit must be returned at the desk during operating hours, not through an exterior drop box. The member who borrowed the kit is responsible for any lost items; the cost varies depending on the item.